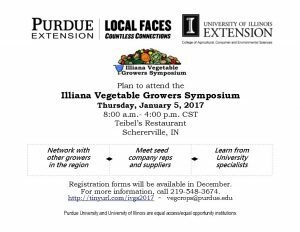 The Indiana Horticultural Congress is an educational meeting designed to meet the needs of fruit, vegetable, wine, organics, and specialty crop growers and marketers in Indiana and surrounding states. All interested individuals are invited to attend. For hotel reservations: Book your group rate for Indiana Horticultural Congress & Trade Show on-line, or call (800) 991-3346 and state you are making a reservation for the Indiana Horticultural Congress, Indianapolis Marriott East. Location: River Ridge Farm, Roann, IN. Aquaponics is a system that combines fish rearing and vegetable production. Topics include food safety of vegetables, pest control in aquaponics operations, indoor environmental conditions, vegetables for aquaponics, greenhouse structures and fish in aquaponics operations. Early-bird registration fee through Sept. 18 is $90 for Indiana Aquaculture Association Inc. (IAAI) members and $100 for non-members. After that date, registration is $100 for IAAI members and $125 for non-members. An optional tour of Green River Greenhouse can be added for an additional $20 per person. Registration is available at www.indianaaquaculture.com.